The Kluge EHF Series Press takes the standard EHD and raises it to the next level. A stronger main frame, stronger platen bolts and heavier side arms give the press greater impressional strength. Improved side arm design gives the press almost three times the preload pressure. These differences plus improved user-friendly modifications; make the EHF the new standard of the industry. The EHF features speeds of up to 3,300 impressions per hour, the EHF can accommodate up to 17″x 24.75″ (431mm x 629mm) sheets, with up to 40 square inches of die area. All Kluge presses can be supplied with the electrical specification of your country. The Kluge feeder, while simple in design, offers ease of operation and unmatched versatility. The straight-in/straight-out feeding motion prevents misfeeding of stock, allows for a wide range of stock thickness and assures accurate registration. The open bottom design and use of air blast allows the feeding of odd-shaped and circular cut stock. The entire feeder can be swung away for complete access to the platen area for easy make-ready and setup. Designed to be even more operator-friendly by making the foil unwind and rewind shafts more accessible to the operator. The unwind and rewind shafts are staggered, making it easier to observe the unit while in operation. The foil unwind shafts are designed to accept 7 inch diameter foil rolls for longer runs between foil reloads. In addition, the mounting system for the unwind shafts has been strengthened to minimize the shake that naturally occurs from the action of the press. From the beginning, the accuracy of the gap, between image stamps on the foil, has been the number one goal of the Kluge Electronic Foil Control Systems. Greater accuracy allows for maximum foil savings without worry of a bad sheet. This new unit incorporates a stepper motor control system that can control motion to within .001″. This allows the unit to hold a tolerance as close as +/- .016 ” at the foil gap making the potential for a quick payback through foil savings a reality. Is available with (up to) four separate draws – each capable of alternating the sequence operation. Additional draws (up to a total of four) can be added in the field. An optional foil seam skipper feature is available for non-registered holograms. The foil seam skipper ensures that the seam is never stamped on the product and is successful in doing so with minimal waste. Unlike some other foil control systems on the market, each foil draw includes it’s own separate rewind shaft. A foil detector is available, as an option, which stops the press when the foil runs out. This allows the operator the time to attend to other important details. A friendly and contamination-resistant touch screen achieves operator interface. It is available in inches or millimeters and English or Spanish. The touch screen control can be located in the operator side swing guard or in a movable control console that includes tool drawers and a work surface. This unit comes standard with storage memory of 25 separate foil draw lengths for recurring jobs. The press operator can simply call up, by number, a previous run job. Or, if a previous job was similar, it can be called up and modified, thus saving valuable set-up time in either case. The Kluge toggle base features a honeycomb design, enabling an infinite range of secure die mounting positions. The die heating plate (or hot plate) has two independently-controlled thermostatic heat zones for controlling the temperature of the dies mounted across the press ‘live’ area. The toggle base for the Kluge EHF Series Press comes lightweight and grid-etched as standard (optional on the EHD). The grid has a layout to match the corresponding grid on the platen, enabling quick and accurate die placement. Weighing only 14lbs (regular weight 40lbs), operators also benefit by less effort required to mount the toggle base to the press. Until now, adjusting the platen bolts and/or adding packing behind the make-ready plate has been the make-ready process for impression adjustments on Kluge presses. Adjustments to the platen bolts are cumbersome and time consuming. Each bolt has to be adjusted equally to maintain as close to level as possible. Because of the inherent design, when raising the platen to increase pressure the platen is put out of parallel with the bed slightly creating more pressure toward the bottom of the platen. Adding packing is limited by the various thicknesses of the available packing and therefore not infinitely adjustable. When adding spot packing, the carrier sheet used would increase the impression to the whole image as well as the spot. In short this make-ready procedure is very time consuming and requires much skill. The new adjustable impression design works on the principle of adjusting the impression by shortening or lengthening the side arms. The adjustment is made by simply turning a crank handle and both side arms are simultaneously adjusted equally. Total adjustment is .144″ (just over 1/8 inch) and equals12 flats or 2 revolutions of the platen screws. The adjustment is infinitely variable and not in steps as is packing. Parallel of the platen to the bed is not affected. Of course, spot packing will still be necessary but the affect it may have on the rest of the image will be easily rectified by backing off the impression with the adjustable impression. If, while running a job, the impression diminishes a simple turn of the handle gets you back in business. This new design has been coupled with a recently released new dwell side arm design. This new patented design offers a longer dwell time at a higher dwell impression than the previous design resulting in more foil coverage and higher production speeds on many products. In addition, the simple switch of this design from dwell to non-dwell operation will save time and greatly increase the use of the dwell feature. The design incorporates spherical bearings at the back shaft, which are more forgiving and, therefore, will offer longer life. In short, this new development will greatly decrease make-ready time, take much of the required skill out of the press operation and will result in reducing the costs associated with both of these production challenges. The Kluge delivery system utilizes a four-finger delivery arm operating on a straight-out motion. Combined with a receding pile delivery table and impression counter, the Kluge EHD will not mar stock and gives the operator accurate press usage. The hot plate temperature controls on Kluge presses are available with dual set points. These provide the operator with a standby temperature and a running temperature. This is beneficial when the press is started. As heat is transferred from the die to the paper stock, a higher temperature setting is required to keep the die at a constant working temperature. If this high temperature is maintained when the press is left unattended, such as during a lunch break, the die will usually become so hot that is will scorch the foil. A general solution to this would be to cycle the foil out of the press when it is not in use, however, the die will still retain enough heat to cause a change in quality when the press is again put into continuous production. The dual set point temperature controllers set with a low standby temperature, automatically changes to the second set point when the press is started, making the transition from standby to operation with minimal effort. Consistent high quality work can be easily achieved with dual set point temperature controls for the standby temperature and operating temperature settings. One of the great features of the Kluge EHF Series Press is that it has been equipped with a vacuum regulator at the operator’s station. The gauge mounted on the regulator indicates the level of vacuum at the feeding sucker tips. This regulator allows the operator to precisely adjust the vacuum level as the press runs. Previous presses have vacuum controls mounted on the vacuum pump behind the press, making it difficult to adjust. The new vacuum regulator is conveniently located at the operator’s station which allows the user to directly observe the feeding action as adjustment is made. The gauge on the regulator allows you to record the exact vacuum level that is required for the job. If the same stock, or job, is run in the future, the vacuum level can be set to the correct value without costly experimentation. The vacuum feed regulator is a standard feature of the EHF Series Press and will save time and money especially on repeat jobs. Brandtjen and Kluge, LLC. offers different rpm motors to drive the EHF model press and accommodate the different products that might be produced. When foil coverage or embossment requirements are at an extreme, additional impressional dwell can be obtained by slowing the press down. Because of the torque requirements of the press, the high-speed motor can only be slowed to 1700 IPH. If further reduction of speed were required, a slow-speed motor would have to be used that allows the press speed to be reduced to 1200 IPH. The upper limit of the slow-speed motor becomes 2300 IPH – compared to 3300 IPH of the high-speed motor. In short, if you have work that requires that the press be slowed below the minimum of the high-speed motor, and work that could be produced over 2300 IPH, you were stuck, as you could not have both. Variable frequency motor speed control technology offers sufficient constant torque to allow us to offer the best of both worlds. With this technology, we can offer a speed range of 900 IPH to 3300 IPH that exceeds the high-speed motor and slow-speed motor speed ranges combined. This broader speed range increases the longest dwell time by 89% over the high-speed motor, and by 34% over the slow speed-motor. The latitude of this speed range increases the production capabilities of the press, thus increasing revenue opportunities. Variable frequency technology has been around for several years and has evolved to the point where it suits the Kluge press application well. The control achieves speed variation by varying the frequency of the AC power to the AC motor, thus eliminating any mechanical parts previously used for speed control. The result is a very dependable speed control system. Couple this with the built-in limit feature, that provides additional overload protection for the press, and you have the ideal drive system for a Kluge platen press. The console displays indicator lights for Power, Low Air Pressure and Safety Gate Open. The Reversible Register Cam is time saving feature from Kluge that makes switching between gear and operator side registration a breeze. Before introduction of this feature, press operators needed to remove the entire cam and replace it with the opposing cam in order to switch sides for registration. The difficult-to-reach location made changing from one cam to the other a time consuming task and springs and nuts were often dropped or lost under the press, further increasing down time. The left and right side register cams are mounted together on a spring loaded wedge body that enables you to switch side guides quickly. By pulling out, turning 180 degrees and releasing, the reversible register cam effortlessly switches from gear to operator side registration and visa versa in only 3 seconds. What’s more, the switch can be made without the need for tools, speeding the process even more. Our line of 14 x 22 presses include a unique standard feature that increases productivity for stock types that are thicker (or double thickness) at one end while thinner at the other. Job types that feature these characteristics include envelopes, single panel folders etc. When stacked, the thickness difference in these types of products are multiplied and the pile does not stand evenly when loaded into the magazine. This leaves a tapered pile that is extremely difficult to load, especially with larger quantities of stock. All Kluge standard feeders on our line of 14 x 22 presses include our unique “Variable Pitch Feature”. Here the stock back supporting plate of the magazine can be disengaged from its fixed position and locked into variable pitch mode. While in variable pitch mode, the back plate is titled to compensate for uneven stock at the feeder (or front) end of the pile. This enables the feeder arm can easily pick up the next sheet as the stock is positioned parallel to the sucker tips. As the stock pile is used up the back plate gradually tilts to an upright position to maintain accurate compensation for the irregular stock thickness.The video here is a quick demonstration of how the Variable Pitch feature works. The back plate is manually advanced and reversed to clearly show the mechanism. To see the feature with stock loaded and in production see below. Our line of 14 x 22 presses include a unique standard feature that increases productivity for stock types that are thicker (or double thickness) at one end while thinner at the other. Job types that feature these characteristics include envelopes, single panel folders etc. When stacked, the thickness difference in these types of products are multiplied and the pile does not stand evenly when loaded into the magazine. This leaves a tapered pile that is extremely difficult to load, especially with larger quantities of stock. All Kluge standard feeders on our line of 14 x 22 presses include our unique “Variable Pitch Feature”. Here the stock back supporting plate of the magazine can be disengaged from its fixed position and locked into variable pitch mode. While in variable pitch mode, the back plate is titled to compensate for uneven stock at the feeder (or front) end of the pile. This enables the feeder arm can easily pick up the next sheet as the stock is positioned parallel to the sucker tips. As the stock pile is used up the back plate gradually tilts to an upright position to maintain accurate compensation for the irregular stock thickness.The video here demonstrates feeding a “stasher” format job, which is essentially a single panel pocket folder with a single pocket. The pocket portion of the stasher is pre folded and glued and is therefore double the thickness of the stock at the top of the piece. At the end of the video is a demonstration of manually advancing and reversing of the Variable Pitch feature without stock loaded into the machine.Note: This video demonstrates feeding only. There are no finishing techniques applied to this job., includes manual advancement to demonstrate the tilt action. The overdrive system for the EHF speeds up ‘off-cycle’ time. This means that the time on impression can be slowed down to the speeds required to accommodate large coverage jobs. However, overall impressions per hour (IPH) are not reduced. For large coverage jobs, impression speed should sometimes be slowed down to as low as 600 IPH. The regular EHF is capable only of a lowest speed of 1700 IPH. By utilizing the overdrive system, the EHF press can be slowed down to a speed of 600 IPH. The Overdrive System is available for the EHF Series Press, and can only be installed on the purchase of a new press. A timing computer in the press has been programmed to speed up the press drive motor just after the platen impression. As the press opens the motor accelerates, as the press closes the motor decelerates so that the platen impression is at the original speed and the production speed are each controlled separately. The operator first chooses the actual impression speed and sets up the job. When the set up is complete and the press is running, the operator may choose overdrive operation. the operator now sets the production speed independently of the impression speed. Typical production gains are shown in the chart below (all tests were made at 40 tons of impression). At speeds over 2000 iph, the cycle time is too short to allow significant savings and over drive cannot be engaged. All production at 2000 iph and higher will be run at a single motor rpm. The graphic below shows the touch screen panel for the Overdrive System. Roll over the buttons to view their function. The mechanical jogger prevents a “saw-toothed” edge on your finished pack by pushing each sheet (as it lands on the delivery table) into a straight pack. This makes for easy reloading on second runs and facilitates faster packaging. The preload magazine allows you to reload the press with new stock while the press is running, therefore less down time and higher production speeds. Perfect for long runs such as greeting cards or book covers. Electrical 3 h.p., A.C. 230/460 volt, three-phase, 1800 rpm, 60 cycle constant speed motor with v-belt drive and variable pitch pulley. Other voltages and cycles available. *The Wide Magazine option increases maximum sheet width to 26.25″. **Standard delivery is available in place of Delayed Delivery, allowing for a minimum sheet size of 3″ x 3″ and maximum sheet height of 15″. Download product literature for the EHF Series Press. What’s the Difference Between an EHD and an EHF? In general, the Kluge EHF Series Press has many more standard features than the EHD Series. This gives the EHF greater and more efficient foil stamping, embossing & die cutting capabilities on both short and long run print jobs. The table below provides an overview of the differences between the EHD and EHF Presses. 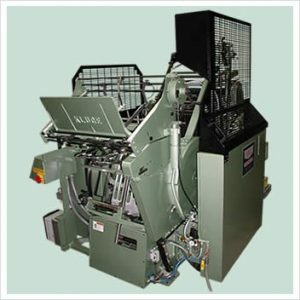 Contact Kluge for further information on these presses.